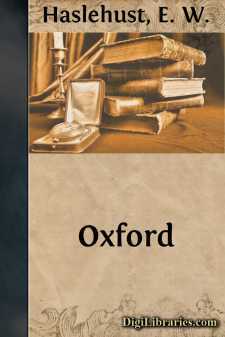 For beauty and for romance the first place among all the cities of the United Kingdom must be given to Oxford. There is but one other—Edinburgh—which can lay any serious claim to rival her. Gazing upon Scotland's capital from Arthur's Seat, and dreaming visions of Scotland's wondrous past, it might seem as though the beauty and romance of the scene could not well be surpassed. But there is a certain solemnity, almost amounting to sadness, in both these aspects of the Northern capital which is altogether absent from the sparkling beauty of the city on the Isis, and from the genius of the place. The impression that Oxford makes upon those who, familiar with her from early years, have learnt to know and love her in later life is remarkable. Teeming with much that is ancient, she appears the embodiment of youth and beauty. Exquisite in line, sparkling with light and colour, she seems ever bright and young, while her sons fall into decay and perish. "Alma Mater!" they cry, and love her for her loveliness, till their dim eyes can look on her no more. And this is for the reason that the true lovableness of Oxford cannot be learnt at once. As her charms have grown from age to age, so their real appreciation is gradual. Not that she cannot catch the eye of one who sees her for the first time, and, smiling, hold him captive. This she can do now and then; but even so her new lover has yet to learn her preciousness. It is worth while to try to understand what are the charms that have grown with her growth. There was a day when in herself Oxford was unlovely to behold, and when romance had not begun to cling to her like some beautiful diaphanous robe. It is possible to imagine a low-lying cluster of wooden houses forming narrow streets, and occupying the land between the Cherwell and the Isis, nearly a thousand years ago. In those days no doubt it was reckoned a town of some importance, but, with the possible exception of the minster of St. Frideswide, there was nothing to relieve its squalid appearance. After the Norman Conquest, when most of the houses in the town had been destroyed, there began to be a certain severe dignity rising up with the building of the forts and the castle by Robert D'Oily, who came over with King William. The fine and massive tower, with a swiftly flowing branch of the Isis at its very feet, forming a natural moat, still stands as the single relic of D'Oily's castle, and the first in point of age of the existing charms of Oxford. Standing, as it does, inextricably mixed up with breweries and the county jail, it must feel itself in a forlorn position, and slighted by those who give it a mere glance on their way from the station to view colleges, old indeed, but, in the opinion of the ancient tower, things of mushroom growth! And yet, close by stands something older even than the tower. Inside the castle walls was an immense mound, and there it stands to this day. No one rightly knows its age, and, except for the romance which hangs about anything, the origin of which is lost in the mists of ages, it adds but little to the charm of Oxford. Another grand old tower is said to have been the work of Robert D'Oily, viz. that of St. Michael's Church in Cornmarket Street. Besides being part of a church, this was also one of the watch towers on the city walls. It is well worth looking at, for it has the further interest of having adjoined the north gate into the city, over which were certain chambers forming the Bocardo Prison, which remained in use until comparatively modern times.